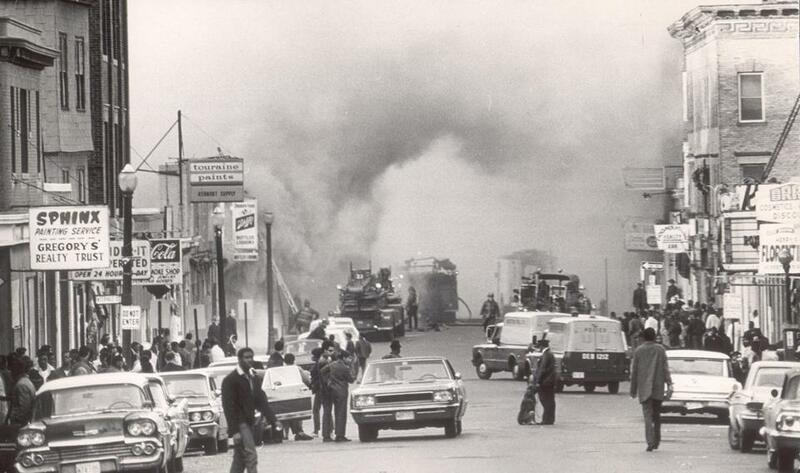 Fires burned on Blue Hill Avenue on April 5, 1968, a day after the assassination of Martin Luther King Jr.
Fifty years ago, Boston banks began a program with City Hall to increase home ownership for African-Americans. It was called the Boston Banks Urban Renewal Group (BBURG). It was a response to the assassination of Martin Luther King Jr., and the requirements of the housing act of 1968 forbidding discrimination in making home mortgages available. But the program became a disaster for these neighborhoods and for the Jews and Irish Catholics and African-Americans who lived there. This is a good time to remember all the contingent disasters that emerged from that era, and consider the lessons they offer for today. Blockbusting. About 20 realtors opened offices in the vicinity of Blue Hill Avenue and Morton Streets. It was a predominantly Jewish neighborhood, next to Irish Catholic neighborhoods. Boston leaders fail to respond. The Mattapan Organization, a local civic improvement group, tried to oppose these policies by challenging realtors, asking the banks to change the program, and asking political and Jewish community leaders for help. Mayor White didn’t respond. He later admitted he was focusing on running for governor in 1970. The Boston City Council passed a measly $25 fine for blockbusting. The banks refused to reform the program. Downtown major Jewish institutional leaders, who lived in the suburbs, suggested that the thousands of working-class Jews living in Mattapan and Dorchester move. Failure to conduct required home inspections. With a Federal Housing Administration-insured mortgage, the federal government was supposed to inspect a home before it was sold and require the seller to make major structural repairs. These required inspections weren’t done, and new black homeowners inherited homes that needed repairs. This happened all over the country, and we had to organize and get passed a law that allowed the homeowners to file claims for the cost of repairs caused by the faulty inspections. Dorchester Community Action Council and Dorchester Fair Share organized more than 600 black homeowners to apply and get these rebates. Fast foreclosure. But it was too late for over 1,200 homeowners who lost their homes to the “fast foreclosure” practiced by banks on FHA-insured loans. With FHA-insured loans, if the homeowners fell even one month behind due to problems, such as the repairs needed because of faulty inspections, the bank could foreclose, transfer the house to the federal government, and recoup on the mortgage. Had the bank made a conventional mortgage — just between the bank and the homeowner — they would have been much more reluctant to foreclose and much more open to negotiation, since they were not set up to manage foreclosed property. Mismanagement. Then these homes were transferred from the banks to the federal government agency FHA/HUD. The agency mismanaged them by requiring tenants remaining in two- and three-family homes to move out, which led to vacant buildings that got vandalized, stripped of materials, and even set on fire. I know. I lived next door to one of these abandoned homes. Abandoned housing mushrooms. More than a thousand abandoned buildings plagued parts of Dorchester and Mattapan. The Dorchester Community Action Council and Dorchester Fair Share had to organize meetings with city and federal officials to get them torn down. This spread of abandonment became a new excuse for banks redlining this area by no longer making mortgage loans — because it was a deteriorated neighborhood. There’s more on this whole story in the book “The Death of an American Jewish Community,” by former Globe columnist Larry Harmon and Hillel Levine. These events fed a narrative that when blacks moved in, a neighborhood would deteriorate. Yet the truth was that intentional acts of big banks and realtors, and the lack of action and regulation by the government, caused neighborhoods to decline. We learned a lot. Community groups worked with US Senator William Proxmire to get the Community Reinvestment Act (CRA) passed in 1977. It required banks not to redline and to make a fair share of mortgages, home improvement loans, and small-business loans in the areas that gave them deposits, as our neighborhoods did. If banks got poor grades on their CRA lending records, they could be denied approval to merge and open branches. The CRA has enabled 40 years of community groups negotiating reinvestment agreements with banks, totaling many tens of billions of dollars. Santander Bank made such an agreement with community groups just last year. The lessons are many. Big banks are very powerful and can hurt communities that give them their savings. Government help isn’t guaranteed. Organized community groups can have an impact if they do the research, are persistent, and find allies in government. The media need to dig into these stories. Today, community groups face the tidal wave of high rents and high home prices and need to organize to prevent continued financial hardship and displacement. The final story has yet to be written. Lew Finfer is codirector of Massachusetts Communities Action Network and has been an organizer in Dorchester since 1970.